In different industries, different challenges are experienced. This is common knowledge (and sense) in the world of business. For Lubricant Marketers, a common struggle is having a way to gain 360-degree views of their customers. That begs the question: Is all of your customer information in one place and are you struggling to compile it into one organized system? This is why leading lubricant marketers in the Oil and Gas industry use CRM to gain 360-degree customer views. Keeping track of customer information in multiple ways tends to lead to frustration and disorganization, and prevents time-savings and efficiencies, all of which prevent your company from moving forward into a fruitful future within the Oil and Gas industry. You may currently be using sticky notes, spreadsheets, binders, etc. to keep track of your customer information. Though it works for you now, and perhaps on an individual level, consider how your manager or a future sales rep will access the information you store, or how you may have trouble finding it yourself in the future after you haven’t looked at it in a while. Will they have problems getting the information they need? Will they know where it is? How long will it take them to find the information they need? Will it consume most of their time? Will it lead to duplicated efforts? Odds are all of these things will happen, but, in CRM, when all of your customer information is input, the right people can access the right information at the right time to produce time-savings, increase organizational efficiencies, and enable smooth transitions for the future, among other key benefits. 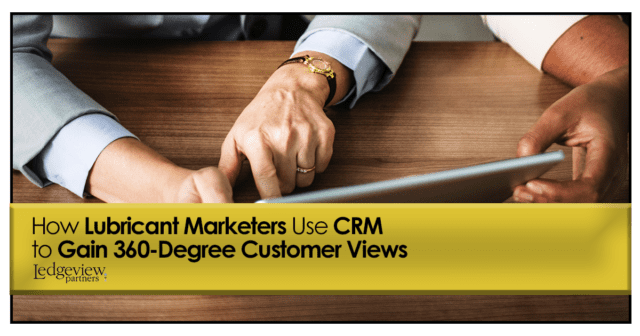 By having 360-degree views in CRM, lubricant marketers are able to see their accounts’ basic and detailed information. If you’ve never worked in CRM before, it may be hard to imagine seeing all of your account information in one place. Trust us – we understand! In CRM, you can see order history, related information, notes from conversations other reps had with the account, and more. CRM eliminates hours of searching for information for lubricant marketers. With a few simple clicks, you will have the information you are looking for about your accounts. With a 360-degree view, you can also see invoice data, open activity tracking, which is extremely valuable and a favorite among lubricant marketers, and 12-month product summaries. This information is especially helpful for customer service reps in the Oil and Gas industry to have access to, as well as your sales team. In CRM, you can give access to the people that need this information cross-departmentally. CRM isn’t just for one department. It’s for your whole organization and can do wonders for the future of your Oil and Gas business and teams. Over time, you will notice increased efficiencies and a fantastic ROI. Learn more about how Lubricant Marketers are using CRM to Drive Success in Ledgeview’s NEW eBook for the Oil and Gas industry!